Our thanks to the attentive and thoughtful waitstaff at the restaurant. Good location. Efficient and professional co-operative staff. Room was spacious & clean. Thanks to all the staff, who had helped us, when needed. I liked the response from Adrija Banerjee when i mentioned that i was not happy with the room. She immediately upgraded me to a suite at a discounted price and mentioned that there were many free perks like breakfast and drinks. When i went to check out, they had charged me for drinks and had to fight to get it taken off my bill and the total cost for upgrade was more than what she offered. When i complained, she said it is due to high taxes. Good breakfast spread. Clean hotel and helpful staff. Got a cake for our anniversary celebration. Location is good.As per booking breakfast included but the staff refused for breakfast. Not much to like about the property for the price you pay. Rooms are so small. The breakfast was excellent! I was assisted by Mr.Kisan he went out of his way to keep us comfortable. Chef Rajat made us fresh pancakes, I would surely rate the food and staff 10/10. The Spa sercives were very good, they make sure the entire steam and sauna room are dedicated to 1 guest at a time which is great! Ambience is very good ,overall staff here is very helpful they make you very comfortable ! 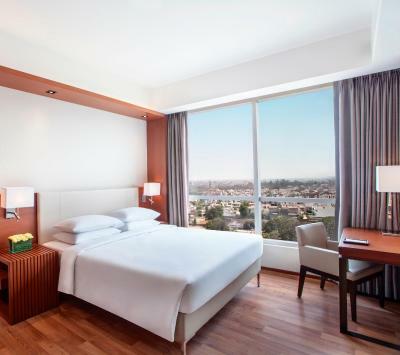 Hyatt Regency Amritsar This rating is a reflection of how the property compares to the industry standard when it comes to price, facilities and services available. It's based on a self-evaluation by the property. Use this rating to help choose your stay! One of our top picks in Amritsar.Offering an all year round outdoor vitality pool equipped with air and water jet features. 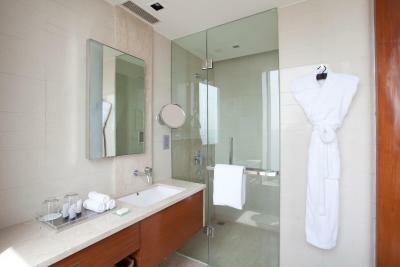 Hyatt Regency Amritsar also has the biggest spa in the city with 8 treatment rooms. The property also offers complimentary AC coach pick up and drop two times a day to the Golden Temple to all its guests. 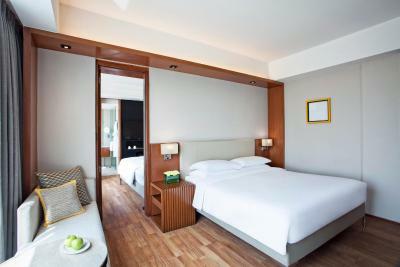 All air conditioned rooms are equipped with a king bed and pillow menu. A flat-screen TV and mini-bar are available. Private bathrooms come with a bathtub. The property has three dining options. Guests can enjoy a meal in the all day dining restaurant Punjab Province and afternoon tea and evening cocktails can be enjoyed at the Scotch Haus. The hotel also provides a business center and a 24-hour front desk. 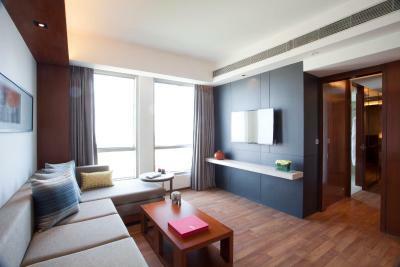 The property has a separate check-in desk for group bookings to provide a hassle free and quick check-in experience. 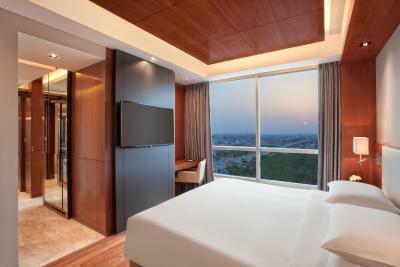 Hyatt Regency Amritsar is 2.8 mi from the famous Golden Temple. It is 3.1 mi from the historic Jallianwala Bagh and Amritsar Railway Station. Sri Guru Ram Dass Jee International Airport is a 30-minute drive away. 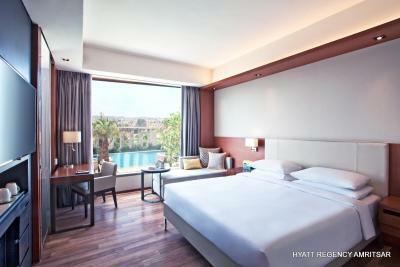 When would you like to stay at Hyatt Regency Amritsar? This double room features air conditioning, a flat-screen satellite TV and an electric kettle. The attached bathroom comes with shower. The room overlooks the pool. 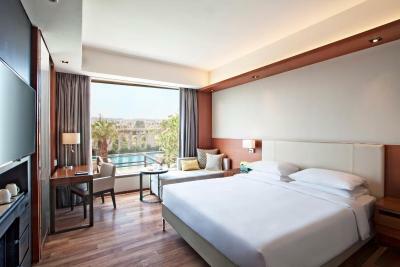 Offering modern decor and overlooking the pool, the suite comes with 2 flat-screen satellite TVs, a separate living room and a well-stocked mini-bar. A walk-in shower is provided. The room overlooks the city. This room features air conditioning, a flat-screen satellite TV and an electric kettle. The attached bathroom comes with shower. House Rules Hyatt Regency Amritsar takes special requests – add in the next step! Hyatt Regency Amritsar accepts these cards and reserves the right to temporarily hold an amount prior to arrival. Please note that the property requires guests to provide a valid ID proof at the time of check in. As per government regulations foreign nationals are required to carry a valid passport and visa while Indian nationals are required to carry government issued photo ID such as valid driving license, PAN card and Aadhar card. 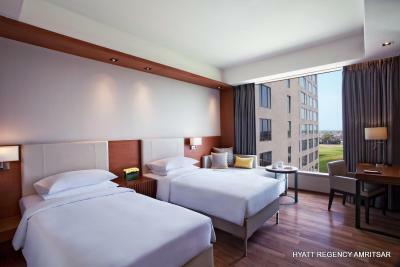 Please inform Hyatt Regency Amritsar of your expected arrival time in advance. You can use the Special Requests box when booking, or contact the property directly using the contact details in your confirmation. Very basic room and struggle with the TV. Great location.Nice experience as it was a comfortable stay and loved the hospitality. Air cond temp cant be changed, been complaining. They only sorted it on the 4th night of stay. Left receipt with front desk to collect parcel in the morning. When asked the front desk at nite of the parcel arrived they took 10 mins to get back still unsure. Then when i asked back for the receipt, they again are clueless. There dont seem to be communication between shifts. Took them 20 mins before they located the receipt. Disappointing attitude from staff of such hotel. Room was not cleaned and even the service was very bad. I was previous memeber of hyatt. But i cam three years after but all services was poor. I left the hotel in 3 hours. I need my money back.